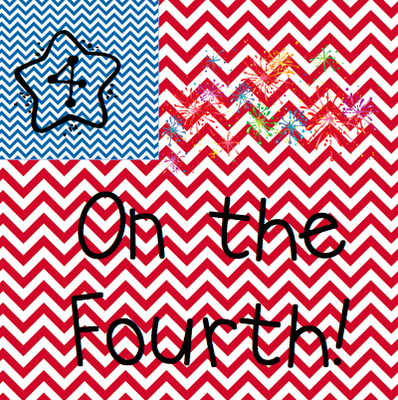 Little Miss Whimsical: 4 on the Fourth... Better late than never! I saw this linky party on Ladybug's Teacher Files and wanted to participate. This is my first linky party!! Woot! I am so excited to start this next school year. In my district, teachers turn in their keys at the end of each year, and can't get back in our school building until the beginning of August. WAAAAAA. We teachers have to wait patiently while our wonderful summer staff cleans our school. It is wonderful having a clean classroom to start out the year, but it is so so hard not getting to go into my classroom whenever I want. Back to the linky party. 1.) I would really like to trade in my desks for tables this year, and have a set up like Dandelions and Dragonflies. I have been thinking about doing this for about 8 months now, but didn't want to deal with the hassle of trading all my students desks out for tables in the middle of the year. You can see Dandelions and Dragonflies groups and bookcases here. I did get to go to Target today and purchase 4 bookcases with my Purchase Order, so I am on my way! 2.) This past year my grade level went to several professional development meeting on Cognitively Guided Instruction. CGI is a math structure in which students discover ways in which to solve word problems without teacher guidance. Teachers don't show students algorithms until after students have practiced and understand a problem type. I used CGI math for most of this year, and saw such unique and creative thinking from my students. As students are solving a math problem, I walk around the room to question their work. I make sure students know that I am not questioning them because they are wrong, but because I want to really see their thinking. After giving students a chance to solve a problem, I choose 2-3 students who have used different methods to solve a problem, and they share their work with the rest of the class. I LOVE student share time, because of the responses from other students. I hear things like, "Wow, I solved my problem that way, too!" or "I never would have thought of it like that, but I wanna try solving it that way next time." Bottom line, CGI allows each individual student to develop ways to solve math problems that are unique to them. Students are pressured to solve a problem one specific way, and are able to develop creative, independent thinking skills. This year, I would like to implement more CGI problems, because I saw such huge growth in my students (especially my SPED students) when using this method. 3.) Going with CGI, I will also be implementing Number Talks on a daily basis. Each daily before our whole group math lesson, I present the students with 3-4 problems (one at a time of course). Each problem builds on the previous problem, and the students are asked to solve the problems using mental math. 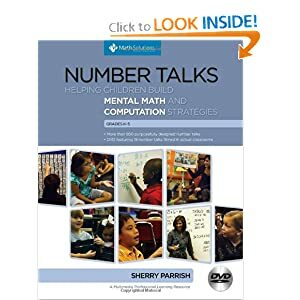 The focus of number talks is not to focus on the equation, but to focus on the properties of numbers, so that you can solve problems more quickly and efficiently. This one is trickier, because it is not a fact they have memorized, but they could use several methods to solve this problem. They might say, well, I know 5 x 3 = 15 and 10 x 3 = 30, and 15 can be broken into 5 and 10, so the answer has to be 15 + 30 = 45. 4. 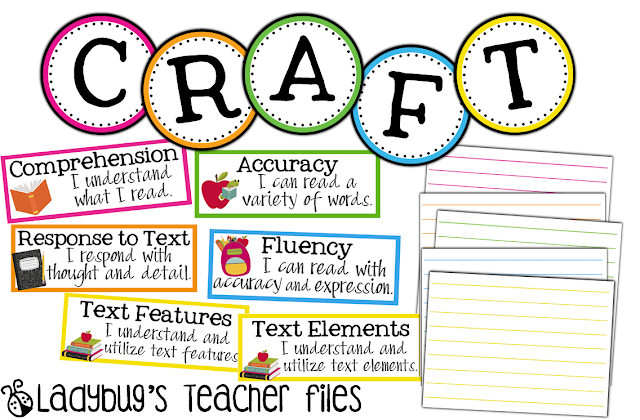 Finally, I want to implement Ladybug's CRAFT board into my Daily Five routine. I think this will be a great way to keep track of the strategies I introduce and that we practice during Daily 5. Do any of you use CGI or Number talks during math? Do any of you use a CAFE or CRAFT or FACE board? How do you like it? Jillian - not sure which grade you teach, as I just stumbled upon your blog, but I too, will be implementing (for the first time) Number Talks!! I teach kindergarten, so it will be a little different - more of showing subitizing (dot) cards and having them manipulate with varying quantities, but I am excited to hear there are others out there trying it out!! YAY!! I teach third grade. I am so excited to see that someone else is going to be teaching Number Talks! I hope you post about your experience with them! Jillian! I absolutely LOVE that checklist! I am so glad you posted that in your store! You are amazing! Wow I love your room set up! Oh and I am with you on #4! Thanks for linking up.